This bridge design concept took second prize in the New Italian Blood Solar Park South Competition. The hybrid system proposed (combining solar and wind power) allows for a continuous production of Energy. 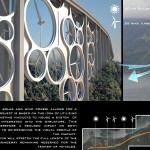 The project is based on the idea of utilizing the space between the pillars of the existing viaducts to house a system of wind-powered turbines which will be integrated into the structure.